Her vet was brutally honest. “Your dog is overweight. And so are you.” She was mad, but he was right. My business is an unusual one. 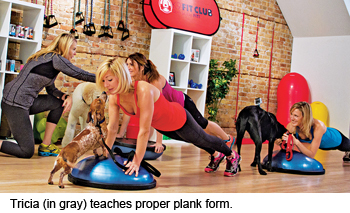 I founded K9 Fit Club, a gym where people and their dogs can work out together. How did I come up with that concept? That’s quite a story. I’ve always loved animals. Health and fitness? Not so much. I’d been overweight all my life, and I was resigned to it. It wasn’t until a doctor forced me to face the truth that I discovered nothing is impossible if you have the right motivation. It wasn’t even my doctor, but my dog Louie’s. Louie was a Basset hound. I’d had my share of struggles, but I knew Louie was one blessing God had given me to get me through the tough times. He was my best friend. I showered him with goodies (we liked the same foods) and made sure he had the best care, with a veterinarian I trusted. Dr. Mayer was kind, gentle and thorough, and he cared about Louie as much as I did. That day I brought four-year-old Louie in for a checkup. “Hello, Tricia,” Dr. Mayer said. “How’s my big boy?” He knelt to greet my dog and check him over without having to lift 72 pounds of Basset hound onto the metal table. Fat. It wasn’t the first time I’d heard that ugly word. I was diagnosed with juvenile rheumatoid arthritis when I was a baby and put on steroid medication that made me gain weight. A lot of weight. Other kids made fun of me. My mom tried to comfort me with food. My dad tried to motivate me with weekly weigh-ins before church. Was it any wonder that I grew up to have dysfunctional eating habits and a negative body image? Still, what Dr. Mayer said cut me to the core. I thought he cared about Louie and me! Why was he being so cruel? I was so upset, i stormed out of the office. I took Louie home. Then I guess you could say I went through almost all the stages of grief. First, denial. I knew I was fat. I was 260 pounds, my heaviest ever. But what could I do about it? This was the way God made me and I was fine with it. If he wanted me to be thin, he would have given me a different body type. Depression hit on the fifth day. I woke up feeling awful. Staggering out of bed I caught a glimpse of myself in the full-length mirror. I usually averted my gaze but something made me stop and stare at my reflection. I wasn’t fine being fat. I was miserable. This couldn’t be what God wanted for me. Thank goodness he hadn’t gotten into the syrup. Chocolate could kill a dog! Only chocolate? an inner voice seemed to ask. How about everything else you’re feeding him? What’s that doing to him? Louie looked up, panting heavily, as if he’d overexerted himself. But he was only lying down. That was the last stage: acceptance. Dr. Mayer was right. I’d thought I was showing my love by letting Louie eat all he wanted. The truth was, I was slowly killing him. How long would we have each other if I kept doing this? I got rid of everything that packed on the pounds. I read about healthy foods for people and dogs, and that’s what I stocked up on. I put both of us on a schedule—three balanced meals a day and two nutritious snacks. No more fast food for either of us. I rewarded Louie by playing with him. Instead of just opening the door and letting him out, I walked him. Only for 15 minutes a night at first. I was too self-conscious to exercise in broad daylight. Before long, Louie and I could make it to the park near our house. Soon I didn’t mind daytime walks. I incorporated lunges, leg lifts, stair climbs into our walks. Louie was with me every step of the way, his ears flopping jauntily. The biggest transformation was on the inside. My self-consciousness became self-confidence. I was ready to join a gym. But every gym I visited had a sign on the door saying No Pets Allowed. Louie was my best friend and workout partner—the best motivator God could have blessed me with. I couldn’t leave him behind. I took the money I’d saved for a gym membership and bought a treadmill, weights and exercise balls for us to use at home. Then we outgrew our home gym. Was there some kind of program where dogs and their owners could work out together? I looked all over the Chicago area but couldn’t find one. I found a business partner and we tested the idea for ourselves. Our first class was at the park near me. We showed up half an hour early and there were already 23 people in line with their dogs, eager to work out. Louie passed on after a long, healthy life. That first class led to many more, and eventually to my opening K9 Fit Club. We now have certified trainers in every state, and even as far away as Singapore. It’s an unusual business, definitely. And an inspired one—inspired by my love for my dog Louie.